When I grow up, I want to live in Cornwall. It's true. The only downside of Cornwall is the lack of readily available vegan food but I can just cook all the time, no big deal. I love it there. My boyfriend and I had two summer holidays there this year and it's just so gorgeous you're left wondering "is this actually England...like, ACTUALLY?" First of all, I really enjoy the drive...as long as I'm not the one driving ;) The views are gorgeous, all the fields and so many cows (I love cows) and of course the Stonehenge, which I know a lot of people think is boring but I listened to a very long podcast about all the conspiracies surrounding it and it's anything but boring. Look it up if you don't believe me. 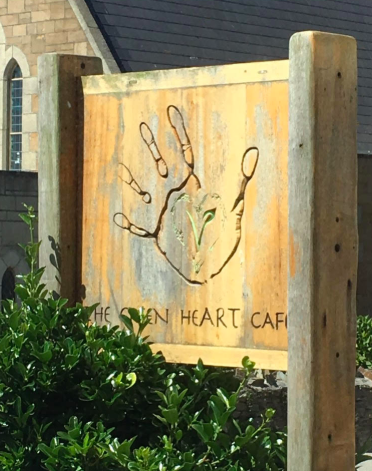 Back in June, my boyfriend and I spent a week in Cornwall, during which, we visited the Green Heart Cafe in Newquay. This veggie cafe has so many vegan options I was OVER THE MOON, it's not easy to find much vegan food in Cornwall and this is some of the best I've ever had. I didn't realise before going in, but this cafe prides itself with the art it has for sale. Gorgeous, unique artwork fills the walls, hence the name Green HeART Cafe. I went for the 'meatball' sub, which was delicious and smothered in cheese, as you can see. It came with a little side salad and huge potato wedges. Yep, I caught him in the act, that's my boyfriend trying to steal one of my wedges even though he had this delicious looking curry in front of him. I wasn't surprised.